I am no fan of the New 52. I do not like retcons, I do not like grim n' gritty. I have no respect for heroes who engage in senseless violence in order to prove how "serious" they are. I read comics mainly for the purposes of escapism and entertainment, and from what I have read about the New 52, both are lacking. (Not to mention decades' worth of continuity having been erased.) I value a good story above all else, and I want those stories to be built on a foundation which remains true to the characters they represent. However, after reading through some trades published within the last ten years or so, a notion hit me: the pre-New 52 years hadn't been very kind to my favorite characters, either. Yes, the New 52 erased a lot of history, but that history contained a plethora of less-than-sterling moments. So, I am endeavoring upon a little quest: to force myself to find 52 good things about the New 52 and its subsequent retconning of so many events. I'm not sure I'll be able to do it, but here goes nothing. 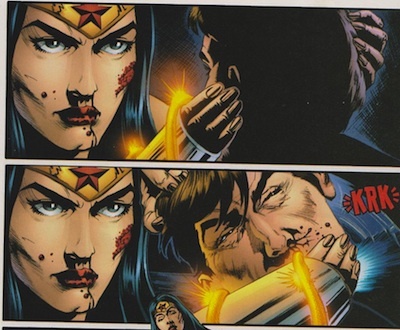 Number 1: Wonder Woman never had to kill Maxwell Lord in cold blood. This was cruel, cold-hearted, and absolutely unnecessary. Nothing but an empty, violent moment which equated shock value with storytelling. I feel better already knowing that this never happened. Well that certainly is negative for a blog called "Comics Make Me Happy" what a shame, to ignorant to see when us comic fans have a truly good thing going for us. Oh well, not like anyone comes here, so this won't scare off new readers. Hopefully in time you'll fall in love with the New 52 like so many others have. Comics made me happy circa 2009; they started making me not care around 2011. Thank you for your comments, anon, but ad hominem attacks and a misspelling of "to" aren't going to gain any traction with me. If you can provide me with ten reasons as to why the characters, story lines, and tone of the New 52 are better than those of the old DCU, I will read the trade of Justice League United and write an honest review of it. Otherwise, simply stating your opinion on the N52 is no more valid than my stating my opinion on the N52. It wasn’t in cold murder, it was because if she didn’t Maxwell Lord would have been able to control Superman and make him do what he wanted. I also think she did it with some revenge for her friend Ted Kord, Blue Beetle. I honestly was shocked at his death but overall satisfied. When comics are light all the time it gets to be to much and when they add angst it makes the story better- at least for me.